Traveling as far and wide as I can, shooting as much as I can. My absolutely favorite trips...for now. A wild horse feeds in a field below imposing Monte Almirante Nieto, in Torres del Paine Park. If it's winter, it's time to head south, to Patagonia. If it’s winter, it’s Patagonia. I’ve met many a trekker and backpacker who come November, or even earlier, hang up their trekking poles and put their sleeping bag and pack away for the season. But winter isn’t the season of the couch; it’s actually the season of exploration, by simply looking to the Southern Hemisphere. Hiking towards the French Valley in Torres del Paine. It’s their summer obviously, and our spring is their fall. Both winter and spring to us are wonderful times to experience their summer and fall. The famous towers which Torres del Paine National Park is named after. In particular, I love Patagonia. March reveals Patagonia's fall colors. Of all of the places I have been, it is the wildest, wind swept, desolate, surprising, and invigorating place I have ever been to and I know this will sound weird, has the freshest air I have ever breathed. I think this is because of several factors, you are close to the coast and to some degree Antarctica. There is little development of any kind, and the fierce winds (more on that in a minute) keep this pristine air blowing in from the southern seas. Of course all of this makes for wonderful star gazing as well, provided you aren’t so tired that you can stick your head out of the tent and look up. Weather in Patagonia is wildly unpredictable, you can get snow in March. I never forget stepping out of my tent in the middle of the night to pee, looking up and being absolutely stunned. Now I have been to the Himalayas, trekked to Everest Base Camp, and I personally believe Patagonia’s stars beat Nepal’s. Could be the absence of yak dung smoke wafting from stoves(of course that is one of the charms of Nepal), but I digress. I also think that the remoteness of Patagonia, lends itself to fewer people, less development, less smog, fewer trekkers and a more pleasing experience. Backpackers set out at dawn on the W Trek, one of Patagonia's more well known treks. For instance, to get to Torres del Paine Park in Chile, I had to fly over night (8 hours) to Santiago, Chile, then take a plane (4 hours) to Punta Arenas (home port of the Magellan Strait), then take a three hour bus ride to Puerto Natales (the jumping off point for Torres del Paine) and then in my case take a two hour boat ride into a neighboring park and then a zodiac boat ride up into the park. That last choice was for scenery, I could have driven from Puerto Natales into the park, but nevertheless, you get the sense that this is one remote territory. 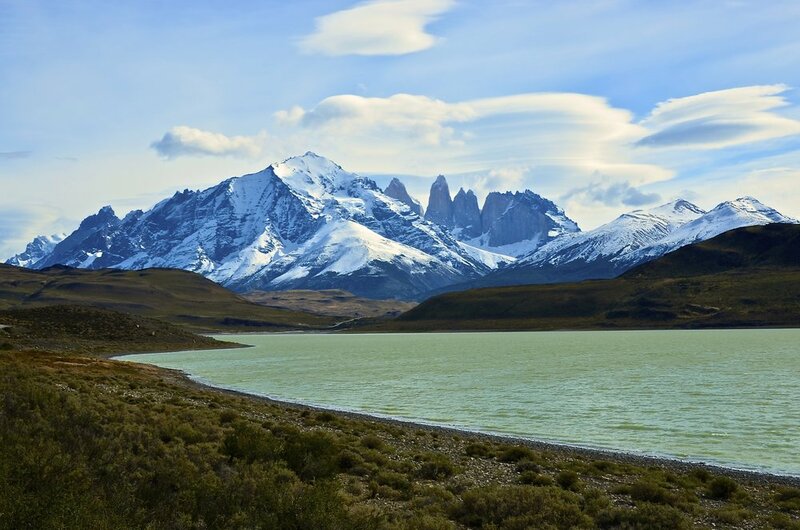 Getting to Argentina’s side of Patagonia and famed Los Glaciares National Park, which houses the dramatic Fitz Roy and Cerro Torre massifs, isn’t much easier. After flying overnight to either Buenos Aires or Santiago, you then need to fly to El Calafate, then hop on a four-hour bus ride. You can do both of these trips, by the way, Torres del Paine Park and Los Glaciares National Park in the same trip. You would probably need two weeks to do these properly. Patagonia's notorious winds whip water plumes up sixty feet in the air. But the wildness of Patagonia is something to see now before it comes developed. The weather and winds of Patagonia add to this sense of wilderness. My first day we encountered 90 mile per hour gusts at Grey Glacier overlook. That night huddled in our tent, we felt 60 mile hour winds and horizontal snow whip our tent. The next day we were sent scrambling back down the French Valley by horizontal sleet, and on our last day we hiked up to the famous Towers in three inches of snow. But I truly loved every minute of it. This was adventure. Patagonia is a feast for the eyes and your camera. Just plow through your Instagram feeds, ever notice how many shots are of the Towers, Fitz Roy and Cerro Torre? The mountains simply frame themselves. They are rugged, fierce looking and rise stoically by themselves. Compared to the Himalayas where one majestic peak runs into another, these peaks rise up separately by themselves as if to say, “take my picture”. So framing is more graphic and heroic. One last note: trash is noticeably absent. Unlike parts of Asia, Patagonia is simply pristine. I noticed our guide would bend down to collect even the smallest gum wrapper. It was as if he was thinking it would be a sin to besmirch this pristine wilderness. The Cordillera Blanca Trek, Peru. I think this just might be my favorite trek. What it takes to climb the ultimate trek: Everest Base Camp and Kala Pathar. Passionate Patagonia: The W Trek in Torres del Paine National Park, Chile. One of my top five treks.